I love learning about new uses for common household items. It’s a great way to save money on specialty products and feel a little like MacGyver at the same time! Aluminum foil is probably one of the most versatile things in your home, so here are a few tips that will definitely come in handy. The next time you have baked on grease on your pots, pans and glass baking dishes, skip the standard cleaning tools and ball up a piece of foil! Just add water and soap to the pan and scrub away. The foil is soft enough not to scratch, but the crinkles in the ball will rub away tough spots easily. The best part is that when you’re done, you can just toss or recycle the dirty foil. No food-encrusted sponges or dish brushes to deal with! There are so many specialty cleaners out there for polishing chrome. 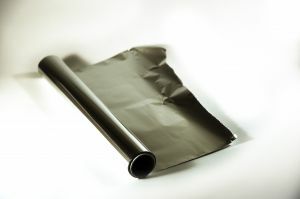 Save yourself the expense, fumes and chemicals with aluminum foil. Wet a sheet of foil with some water and then polish the chrome like you would with a cloth. Replace the foil if it gets too dirty before you’re done. This technique will even remove the more superficial rust spots! Use a balled up piece of foil for more damaged chrome and you’ll hit every last spot. Note: This is a popular method with bike and antique car enthusiasts, but it works on chromed faucets, too! Just make sure what you’re polishing is actually chrome. Many products, like modern cars, now have coated plastic that mimics the look of real metal. Aluminum foil can help you out in the laundry room, too! Form a few balls of it that are roughly 2″ in diameter and you’re on your way to fluffier laundry! Just toss them in with clothes and towels when you dry them and for chemical free fabric softening! The foil comes in handy again when it’s time to iron. That padded board cover is absorbing a lot of the heat your iron puts out. Put a layer of foil under the cover and it will reflect heat upwards for quicker de-wrinkling! Take a break from painting without cleaning the brush first. Just wrap the brush in foil and secure it with a rubber band. This will work overnight and, for longer breaks, stick the wrapped brush in the freezer and then thaw it for an hour before you get back to work. It also makes a perfect, flexible cover for door handles and hinges if you don’t want to remove them before painting. Just wrap the handle and trim the edges with a utility knife for a perfect, custom cover. Wrapping door handles can be real help during any messy project. Wrap all the door handles that are between you and a way to wash your hands and you’ll never be stuck trying to open the door with your elbows! Foil is your friend when you have a vinyl floor tile losing its grip on the ground and curling at the edges. Lay a sheet of foil over the tile and run an iron set to medium over the tile. This will soften the adhesive underneath and un-curl the the tile. Leave something heavy and flat, like a stack of books, on top of the tile and foil overnight and the adhesive should set like it’s brand new again. Another amazing use for foil is for forming a temporary funnel. This is especially useful when you want a funnel for something you’d rather keep off of your kitchen funnels or which would make a mess of the garage ones. You can make your funnel any size and shape and even angle the tip for a custom fit and then toss it (or recycle it) when you’re done! Like these tips? Then you should go “Like” my Facebook page at JackieScuraSays.com! Get daily household tips, local news, fun events and the latest Real Estate market updates!